AND I'M TAY! Here to ruin it. I'm thinking the main reason we made this club is, there's none out there! Trollans are so horribly neglected, despite the pretty substantial fanbase they have. 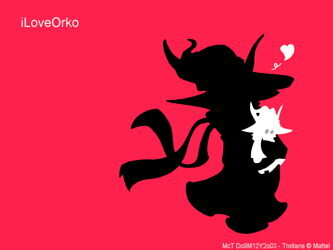 So here ya' go, you wonderful Orko fans, a Trollan fan club. Just a few minor rules to lay out, here. Easy stuff to remember, really. No making fun of other members. If you have a problem with a member of the club for some reason, tell us what's up, and we'll check it out. No mindless bashing! No one likes a person yapping at them simply because they 'don't like that guy you draw', so keep it to yourself, okay? Have some fun, for Pete's sake! This is a fun-loving collective of people! Relax! Ever met a non-friendly Trollan fan? Didn't think so. HERE'S HOW TO JOIN! Send TrollanHQ a note and we'll add you... and it'd be nice if you had a link sending people back to us. To stay in the club, please participate in at least every other contest we have. If we have any more after this, that is. Needs to have our mascot, Devvy, on it. Needs to have TrollanHQ on it. And maybe some dumb Trollan-ish phrase on it. Orko and others of his likeness (c) Mattel and Filmation. Fancharacters (c) their respected owners. Anyway, glad I joined this place... Cuz Orko rocks. I have done some proper trollan art. Welcome to TrollanHQ, SlyVenom! You are now a member. Looks like I'll have to draw some new Trollan Art. Hey, I'm a proper Deviant club member now! |^^| Aren't I, huh, huh? Ignore the comments below! We're OK, folks!